July 4, 2013 | David S. Maldow, Esq. Last month, Zoom released the latest version of their cloud VC service. For those who don't know, Zoom is a relatively new player to the cloud video world. Their initial August 2012 offering was a free service, notable for its business quality video/audio and exceptional ease of use. It allowed unlimited use, with up to 15 participants per virtual room, but lacked key business functionality. 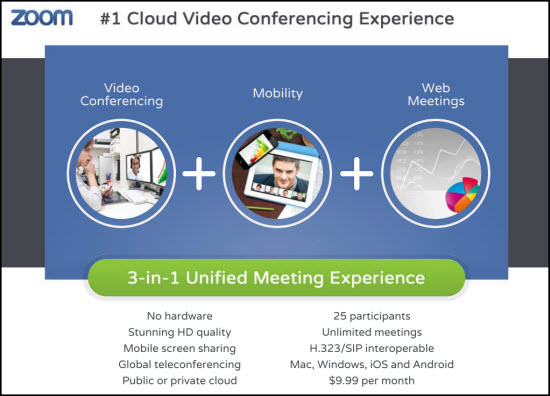 The previous January release was impressive, offering unlimited use of a 25 seat virtual meeting room for $9.99 per month (Only the host requires a paid account, the other 24 seats can all be free guest accounts). It included an updated UI and a unified mobile / desktop experience with leading tablet / smartphone support. For example, Zoom was one of the first (if not the first) vendor to support content sharing from a mobile client. As great as this all sounds, there were still a few key missing features, which I noted in my earlier review. With this new release, Zoom has once again not only met my expectations, but exceeded them. 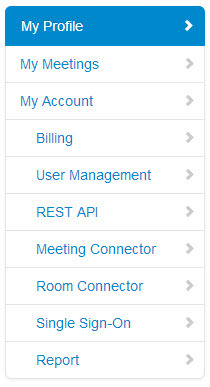 Not only have the added my most requested features (PSTN dial-in, and H.323/SIP interop in particular), they have done so at no extra cost, and have included a cornucopia of productivity based user features and administrative controls as well. In addition to getting the big things right with this release (PSTN dial-in, H.323/SIP interop, advanced screen sharing with annotation, remote desktop control, etc. ), Zoom has managed to get a lot of the little things right as well. The nuances of Zoom's workflow show an incredible attention to detail, as well as a deep understanding of actual user behavior. This solution isn't designed just to make the IT folks happy, it was actually designed with the users in mind (imagine that). For example, Zoom heard from their customers that some people don't like starting a meeting with their video up. It makes them uncomfortable. They would prefer to start the meeting by sharing their screen, with the option to add video afterwards. Zoom responded by tweaking their UI so that meetings can be started as "Video Meetings" or as "Screen Share Meetings" (see above). Either button brings you into a full featured Zoom meeting, but the choice gives users an extra level of control and comfort regarding the way the meeting initiates. Perhaps this is nothing more than a minor workflow issue, but it is a good example of Zoom's responsiveness to user preferences. New Layout Options: Easy switch from highlighted speaker view, to Brady Bunch view, including the ability to "Spotlight" a speaker, ensuring all viewers are watching the right person. There is also a new small thumbnail popup that appears when you minimize Zoom, which you can easily drag around your desktop. Perfect for when you want to stay in the meeting and see who is talking, but really need access to your desktop. Shared Audio: Traditional screen share doesn't work well for sharing videos (YouTube or other). The problem lies within the audio. The screen view itself shares cleanly, but the audio is being played through your speakers, and then picked up via your mic, before being sent through the video client. This means that not only will the audio will be off-sync, the inherent echo-cancellation abilities of your client and/or microphone will be actively blocking the sound you are trying to share. Zoom allows you to share the audio directly through the client, in sync with the video. Admin Account Control: Zoom offers a surprisingly deep administrative menu. 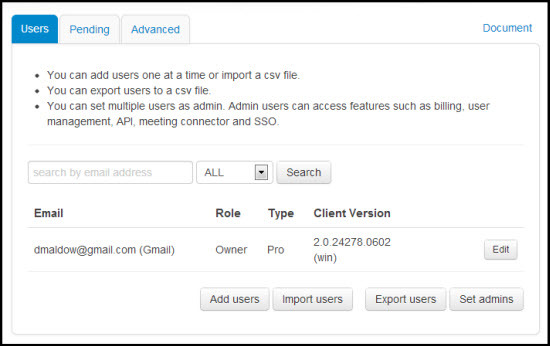 An admin can easily provision new users, create new accounts, manage scheduled and recurring meetings, deploy the free meeting connector service (keeps local traffic within your network for improved performance), set up the Room connector options (for H.323/SIP interop), enable single sign-on for an entire organization, and even enable API integration for really advanced functionality. It even includes a robust reporting engine, with nice clean charts and tables showing usage details and trends. Perhaps most impressive is the fact that the admin UI is just as user friendly as their meeting UI. In other words, anyone in your organization can be your Zoom admin, it doesn't have to be someone with advanced technical skills. Dual Monitor Support: The two monitor desktop is very common, but for some reason very few collaboration solutions are putting any thought into supporting it. Zoom's dual monitor support allows for several improved experience meeting scenarios. For example, users can display a full view of the data being shared on one monitor, and a full sized view of the active speaker on the other monitor, or replace either one at any time with a Brady Bunch view of all attendees. While you can manually achieve this effect with some other solutions by resizing windows, actual inherent support provides a superior experience. The best way to experience Zoom is to simply create a free account and start making some calls. It is still free for 1-to-1 meetings, or for multipoint meetings under 40 minutes in length, so it is very easy to try before you buy. Unlike some competing solutions, no training is required. The UI is so slimmed down (~7 very well labeled and designed buttons) that a video novice will have no problem with features ranging from the simple (muting your audio) to the advanced (recording, inviting additional users, screen share, etc). Why take my word for it? Feel free to make a few calls on Zoom, and tell me in the comments below what you think. Final note, earlier this week, a prominent web meeting service provider experienced an outage, preventing many customers from holding meetings for several hours. Of course, this can happen to any service provider and they did get things running again quickly. But I had to wonder, during that short time when those customers were scrambling for a quick replacement, if any of them stumbled upon Zoom at literally 1/5th the price of this popular solution and had to seriously rethink their communications strategy. Actually, why wait for the next outage? If you are currently using one of those $49.99 per month solutions, compare it to Zoom at $9.99. I have a feeling you will be surprised to find that you aren't getting much (if anything at all) for that extra money. In fact, in many ways Zoom may be an improvement over your existing solution, while reducing your costs. The previous January release was impressive, offering unlimited use of a 25 seat virtual meeting room for \$9.99 per month (Only the host requires a paid account, the other 24 seats can all be free guest accounts). It included an updated UI and a unified mobile / desktop experience with leading tablet / smartphone support. For example, Zoom was one of the first (if not the first) vendor to support content sharing from a mobile client. In addition to getting the big things right with this release (PSTN dial-in, H.323/SIP interop, advanced screen sharing with annotation, remote desktop control, etc. ), Zoom has managed to get a lot of the little things right as well. The nuances of Zoom's workflow show an incredible attention to detail, as well as a deep understanding of actual user behavior. This solution isn't designed just to make the IT folks happy, it was actually designed with the users in mind (imagine that). For example, Zoom heard from their customers that some people don't like starting a meeting with their video up. It makes them uncomfortable. They would prefer to start the meeting by sharing their screen, with the option to add video afterwards. 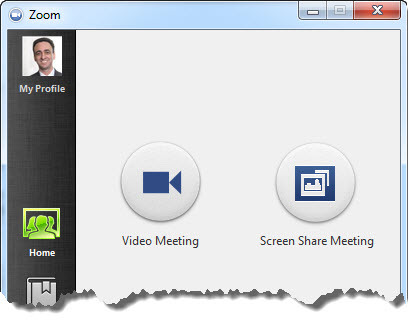 Zoom responded by tweaking their UI so that meetings can be started as \"Video Meetings\" or as \"Screen Share Meetings\" (see above). Either button brings you into a full featured Zoom meeting, but the choice gives users an extra level of control and comfort regarding the way the meeting initiates. Perhaps this is nothing more than a minor workflow issue, but it is a good example of Zoom's responsiveness to user preferences. New Layout Options: Easy switch from highlighted speaker view, to Brady Bunch view, including the ability to \"Spotlight\" a speaker, ensuring all viewers are watching the right person. There is also a new small thumbnail popup that appears when you minimize Zoom, which you can easily drag around your desktop. Perfect for when you want to stay in the meeting and see who is talking, but really need access to your desktop. Final note, earlier this week, a prominent web meeting service provider experienced an outage, preventing many customers from holding meetings for several hours. Of course, this can happen to any service provider and they did get things running again quickly. But I had to wonder, during that short time when those customers were scrambling for a quick replacement, if any of them stumbled upon Zoom at literally 1/5th the price of this popular solution and had to seriously rethink their communications strategy. Actually, why wait for the next outage? If you are currently using one of those \$49.99 per month solutions, compare it to Zoom at \$9.99. I have a feeling you will be surprised to find that you aren't getting much (if anything at all) for that extra money. In fact, in many ways Zoom may be an improvement over your existing solution, while reducing your costs.